This story is cross-posted on Ecosystem Marketplace. 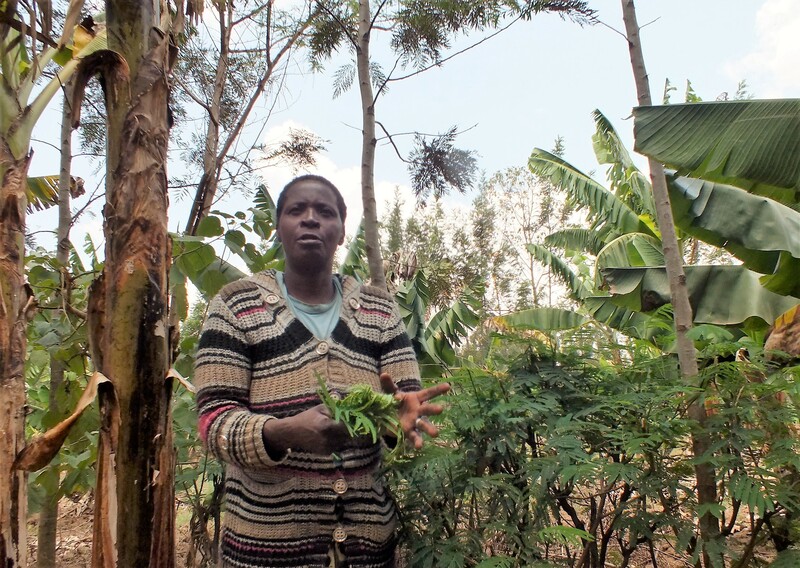 Five years ago, Prisca Mayende's four-acre farm looked just like those around her: treeless and flat, it baked in the sun, lay fallow for periods, and lived on expensive fertilizers. Today, it stands out like an oasis. Trees are everywhere - some in rows separating patches of corn and sorghum, others in clusters, and all pulling carbon out of the atmosphere, converting it to wood and infusing it into the soil. Many are "fixing" nitrogen into the soil as well, providing fertilizer for the crops that are thriving in this once-patchy plot. The temperature is noticeably cooler on her farm than on those around her; the trees provide just enough shade to protect delicate crops and hold moisture. Plump mangoes dangle from some of them; healthy bananas curl up from others; and all sprout thick leaves that she uses as fodder for the dairy cow she purchased with extra income from the increased yields. A teacher by training, she even took a patch of land out of production and built a small grammar school on it. As part of the curriculum, every pupil plants one tree and watches it grow as they progress in learning. When parents drop their children off, they often ask Mayende how she achieved so much on so little, and she directs them to an environmental NGO called VI Agroforestry, which has been teaching these farming methods - called "agroforestry" - since the early 1980s. Like most NGOs, VI Agroforestry's impact is limited by the generosity of its donors, so in 2010 it started experimenting with carbon markets to see if it could expand its operations by generating carbon offsets through climate-safe agriculture, with the income mostly being divided among farmers. The experiment worked, in that it allowed VI Agroforestry to reach more farmers like Mayende, but the revenue-sharing part wasn't the hit they hoped for. "The yields are what I care for," says Mayende. "The little carbon bonus was nice, but it's not why I do this." Those little "carbon bonuses", however, add up - and caught the attention of the Livelihoods Funds, which invest money for food giants like Mars, Danone, and others. Livelihoods isn't a philanthropic endeavor: it's a bona fide impact investor that provides upfront financing to NGOs that help small farmers, and it expects to make its money back and then some by selling carbon offsets. As an impact investor, it aims to do well by doing good, so it only invests in projects that generate verifiable environmental benefits. That means its portfolio is comprised of "conservation investments", as are those of more and more of its peers, according to "State of Private Investment in Conservation 2016: A Landscape Assessment of an Emerging Market", which was published this week by Forest Trends' Ecosystem Marketplace. Based on a survey of impact investors, the report shows that at least $8.2 billion in private-sector money flowed into conservation investments from 2004 through 2015. Nearly a quarter of that finance - $2.0 billion - came in 2015. The pot of money is growing, but investors also said they left $3.1 billion waiting in the wings - and that's enough to launch 30 Livelihoods Funds or help tens of millions of farmers like Mayende. Yet it's just sitting there, and not for lack of investment opportunities. All around the world, for example, environmental entrepreneurs are planting trees or saving endangered forest to generate carbon offsets - a process that requires rigorous verification and validation of the environmental benefits. They often work by promoting exactly the kinds of sustainable practices that Mayende is implementing, and they deliver results in part by making it possible for farmers to earn enough from their own land that they don't have to chop forests for wood or fodder. Last year's annual State of Forest Carbon Finance report showed that such projects now cover at least 28 million hectares - an area slightly larger than Burkina Faso - but it also showed that offsets representing 80 million tonnes of carbon dioxide went either unsold or undeveloped. That means project developers did all the hard work but decided prices were too low to bring their offsets to market - at least for now. "It all goes back to demand," says Kelley Hamrick, who authored the report. "While some investors are willing to risk high market volatility and invest in carbon offsetting, the majority won't until they see clear demand signals." The report focuses on investments that are "intended to return principal or generate profit while also resulting in a positive impact on natural resources and ecosystems," and it explicitly adds that "conservation impacts must be the intended motivation for making the investment; they cannot be simply a by-product of an investment made solely for financial return." By that definition, forest-carbon projects are a no-brainer, while sustainable agriculture could be in a grey area. Nonetheless, of the $8.2 billion that did get invested, $6.5 billion went to food and fiber - primarily sustainable farming and forestry - with the rest going into habitat conservation and water trading programs, which are explicit "payments for ecosystem services" (forest carbon falls under habitat conservation). When asked about that undeployed $3.1 billion, respondents didn't say which projects they'd reviewed and rejected, but simply that the available projects didn't meet their criteria. So, what are those criteria? The most important criteria may be more psychological than logical: investors - like all people - tend to stick with what they know. "Private investors viewed agriculture and forestry as asset classes long before 'sustainability' entered investors' vocabularies," the report says - although later it adds that "environmental credit investments...entail greater risk for various reasons including the influence of public policy on the long-term viability of environmental markets." Project developers can certainly attest to the risk, but most aren't giving up. Indeed, they're holding the offsets they've generated because they believe prices will rise - and with good reason. To begin with, forest carbon is a pillar of the Paris Climate Agreement, which will proceed even if the United States bails out, and the US state of California has shown that demand can ratchet up quickly when a government shows it's serious about climate action. Respondents identified a 5-10% sweet spot for returns on investment, and that's more than achievable - especially if the carbon offsets are embedded in a larger agriculture project, as they usually are. Most forest-carbon projects - especially those that save endangered forests (called "REDD+") - work by helping farmers boost yields so they don't have to chop trees, but most of the sustainable farming and forestry initiatives identified in the survey work by purchasing land and managing it sustainably. The Livelihoods Funds buck that trend, because they explicitly don't buy land, but instead work with hundreds of thousands of small, independent farmers, and they're not alone. Althelia Ecosphere follows a similar model, and many REDD project developers - perhaps most of them - don't take ownership of the land, but rather work with farmers or indigenous people to manage their land more sustainably. Carbon finance, in other words, is increasingly blended with sustainable agriculture initiatives - and it could help investors address another shortfall identified in the report: namely, the inability to quantify the environmental impacts they're aiming to deliver. Layering in carbon, it turns out, means adopting rigorous and time-tested verification and validation of all environmental benefits - which Mayende says helped her boost her yields. "To get the carbon bonus, I had to keep better records," she says. "That made me a better farmer, and that meant more income, which enabled me to build all that you see her." And that, in the end, is language all investors understand.